Cupcake Tier DIY Coming Soon! I’ve bought some of the materials and tried out the shape and height yesterday! It’s balancing on Vitagen/Yakult bottles now. Haha! I may actually use them, I haven’t decided. I’m still hunting around for things that can be recycled. I couldn’t find the largest circle for the most bottom piece so I swapped it for a square. I don’t think it’s a big problem, after dressing it up, no one will probably notice. 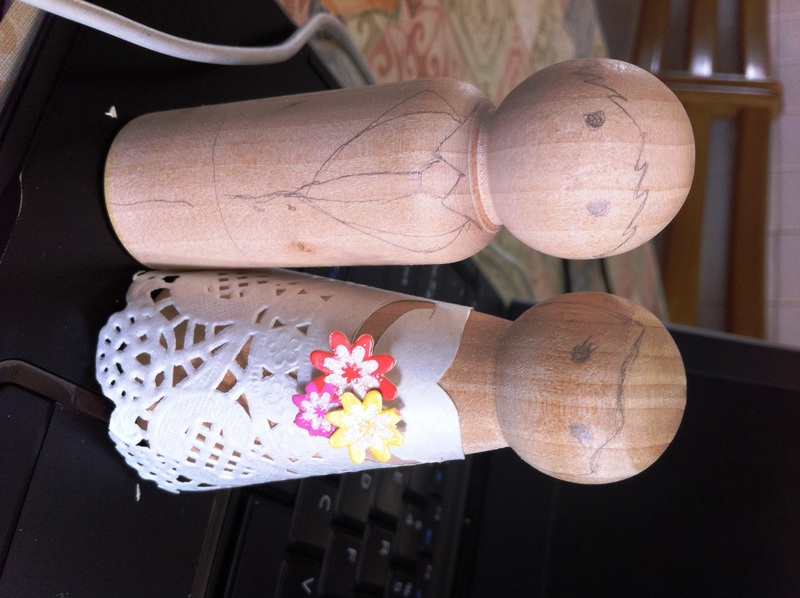 While we are on a budget for the wedding, M and I also thought it was important to make things meaningful. Often couples don’t know why they want such an extravagant wedding, some don’t have much meaning to them. So in an effort to save money + makes things meaningful, I asked my mum to bake our wedding cake! She’s quite an accomplished baker. Not much of a cook, but no cake has ever gone wrong if they were made by her hands. Her Signature? My eurasian grandma’s recipe of Sugee Cake. I grew up sith my kitchen constantly smelling like freshly baked sugee cake, a smell I always associate with my mother. I probably did dream of a professionally decorated cake with fondant or buttercream flowers – but nothing compares to my own mum giving my the gift of her creation. That said, I want to share the cake with everyone there and what better way to indulge the masses than with a perfectly sized CUPCAKE. 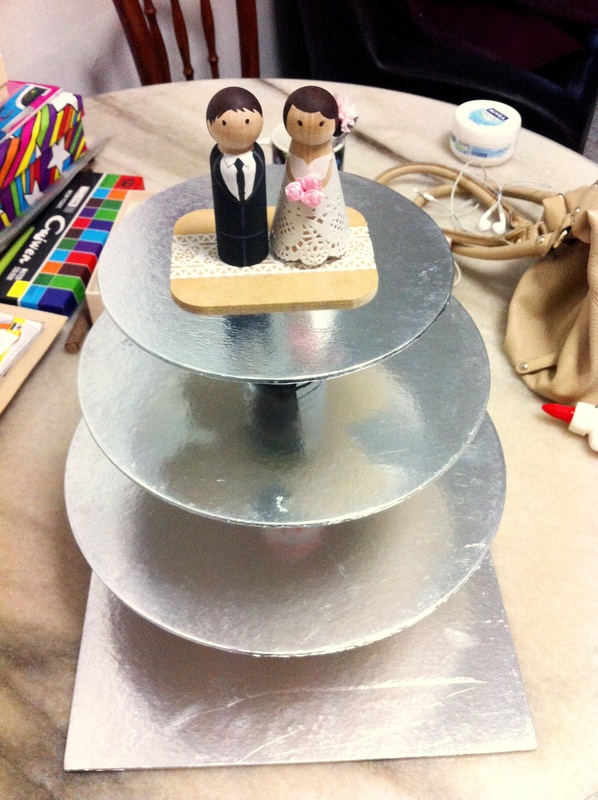 Next big DIY Project: My Wedding Cupcake tier Stand. Check out this amazingly easy tutorial @ Cake Journal. Looks so simple and yet so pretty! This Weddingbee made this! With lacey edges! So cute! This DIY bride pasted maps on the tops of her tier, giving a lovely vintage look! Creative no? Ok, off to draft mine up! What should I include for mine? Doiles? Lace? How many tiers for 180 people? 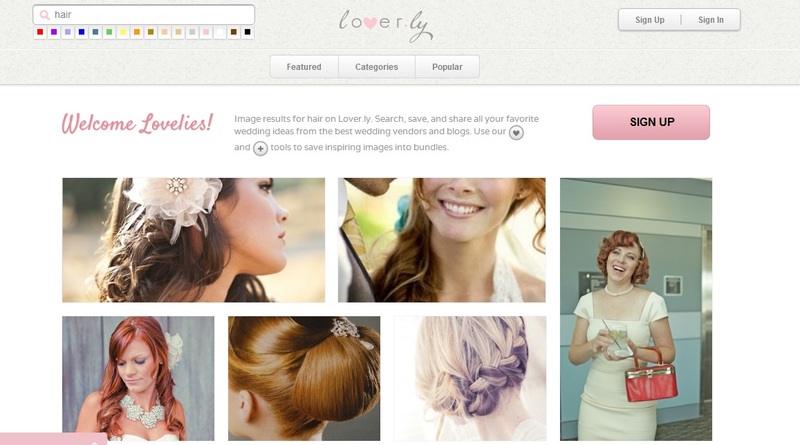 This website is pinterest just for all things bridal or wedding related. 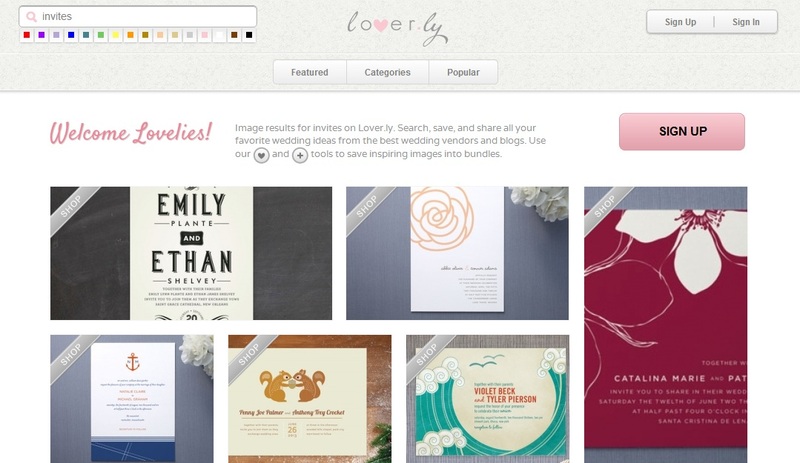 Its full of inspirational pictures of brides, flowers, invitations, vintage decor and so much more. I could spend hours (literally) just browsing through the huge collection it has. You have got to visit this website! What I love about the site is the pictures are big and bright, neatly collaged and every single one of the photos are of a certain quality that I love. I realise there are no amateur pics, no blurry self shots! Gonna think about doing an inspiration board for my hair and make up next! And the count down begins! Exactly 1 year more. three.hundred.sixty.five.365 days to go – I’m part excited, part terrified, part anxious, part slightly sad and part calm at this moment. 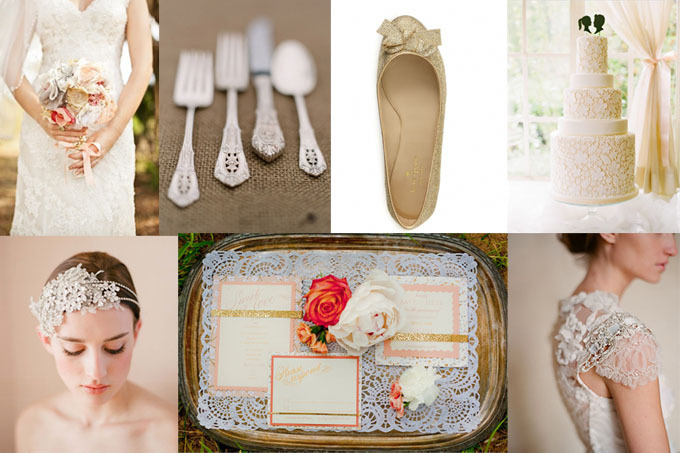 La Mariee Wedding House is having a sale at the end of this month! Signed myself up for the earliest slot and got my focus on to find myself an evening dress! Up to 50% of and dresses are selling for their retal prices. TIP: Bridal houses are always getting rid of their old items to make way for the new ones. Budget brides who don’t mind a pre-worn or last seasons dress can find AWESOME deals here.. Be patient and wait for the sales. All I need now is to appoint a bridesmaid to follow me! 1. I took a cardboard sheet and traced the shape of the banner on it. 2. Using a pen knife, I carved the shape out. 3. Painted it with water/acrylic colour and designed it as I wanted to. 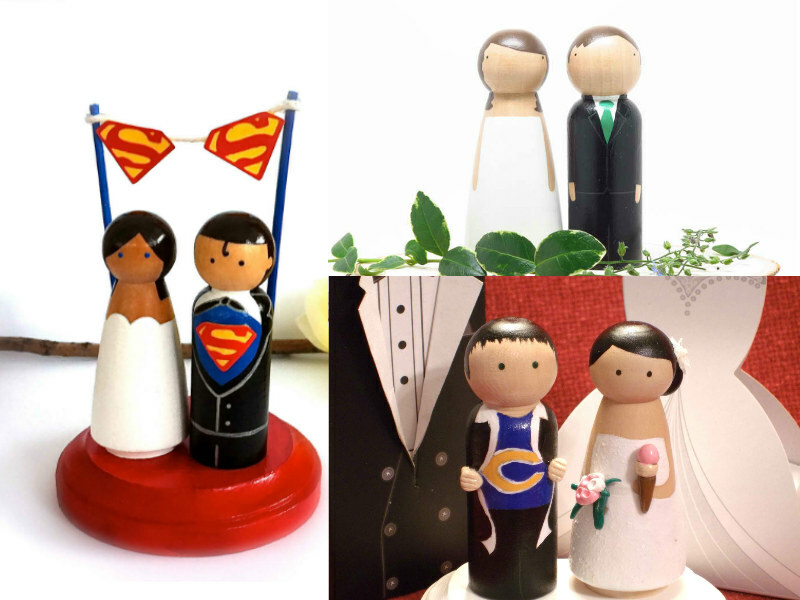 If any of you are as much a fan of Etsy as I am, you would probably have seen photos of these adorable wooden doll cake toppers. 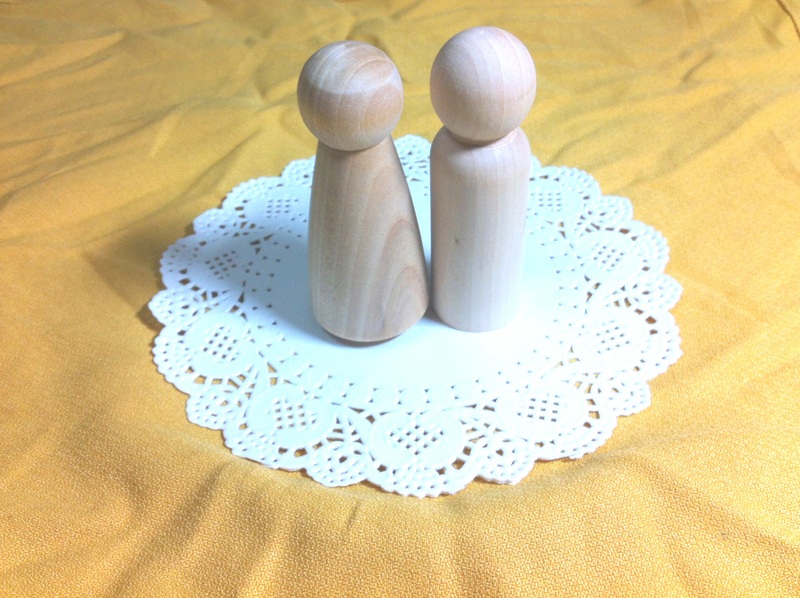 They are short little stubby people that are hand painted by the sellers to resemble the couple. 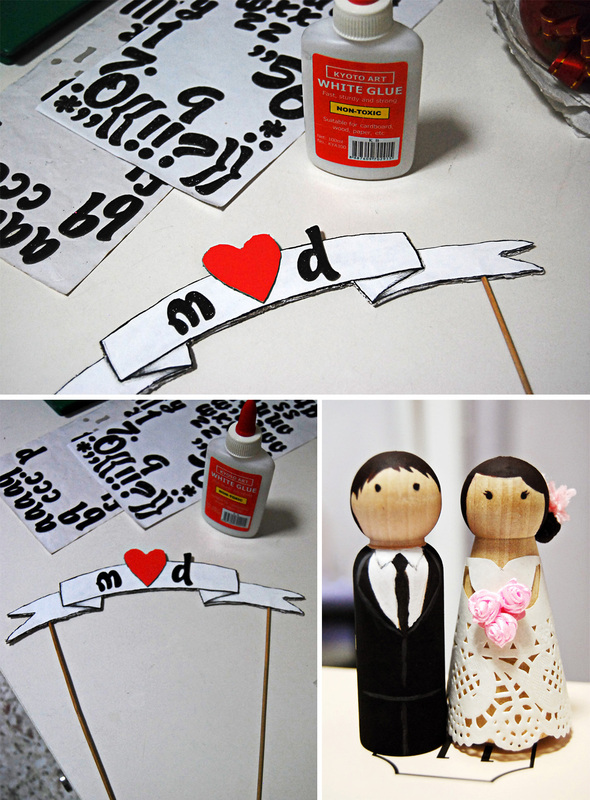 First time I laid eyes on this idea I knew there was no other cake topper out there for me. Problem is most of them cost a bomb. Depending on the complexity / customisation of the doll, it could cost from $50 to $88 US Dollars! That’s $110 Singapore Dollars EXCLUDING SHIPPING!! I have a budget to keep to man. 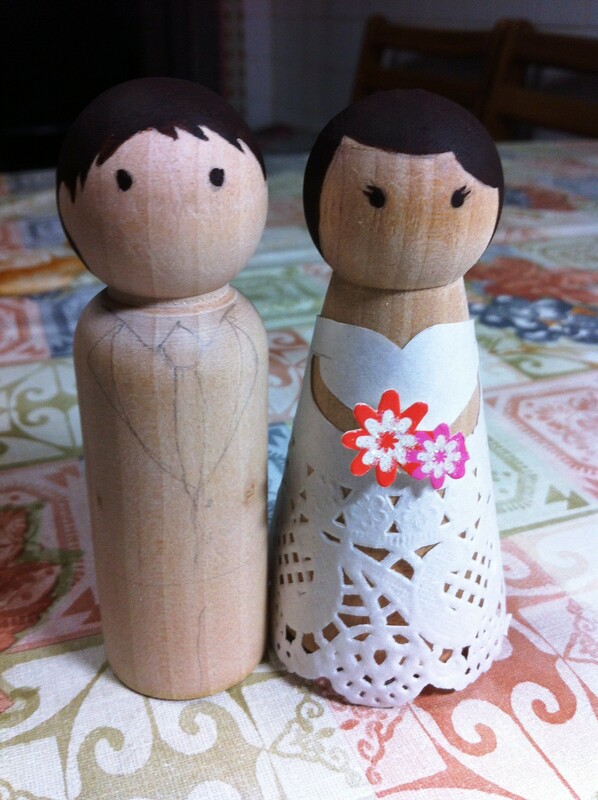 So I decided to trust my hands and amateur painting skills, get the naked dolls and paint my own cake topper! 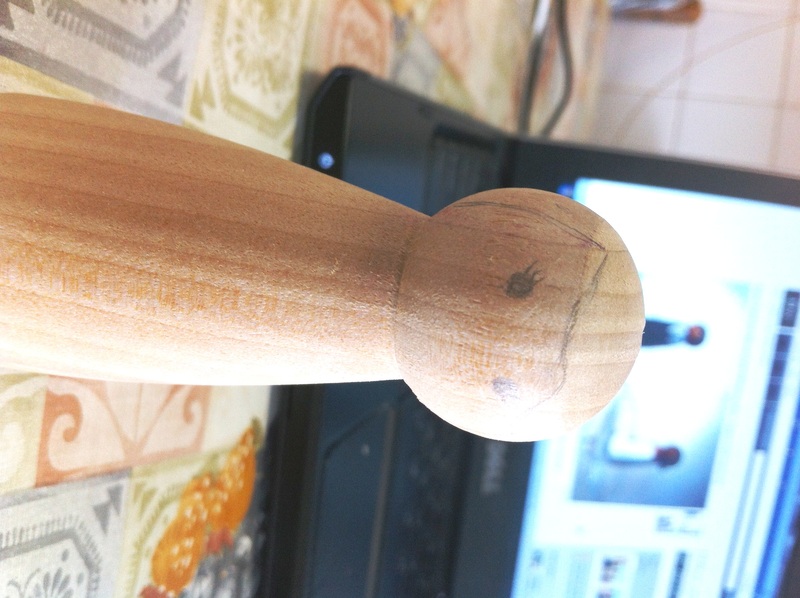 Got the supplies from Etsy too from Wood Toy Shop at $14 SGD including shipping. 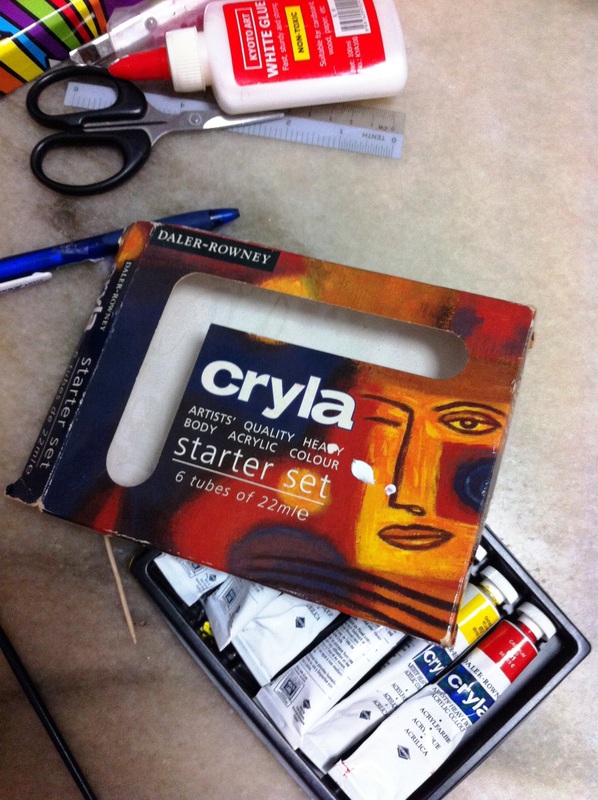 🙂 Used cryla acrylic paint I already had for longveity. I first sketched out the faces by referencing the ones on Etsy (kudos to them!) and the outfits. ! cut out a patterned dress from my huge collection of doillies and shaped sweet heart neckline. I think it’s pretty cute. 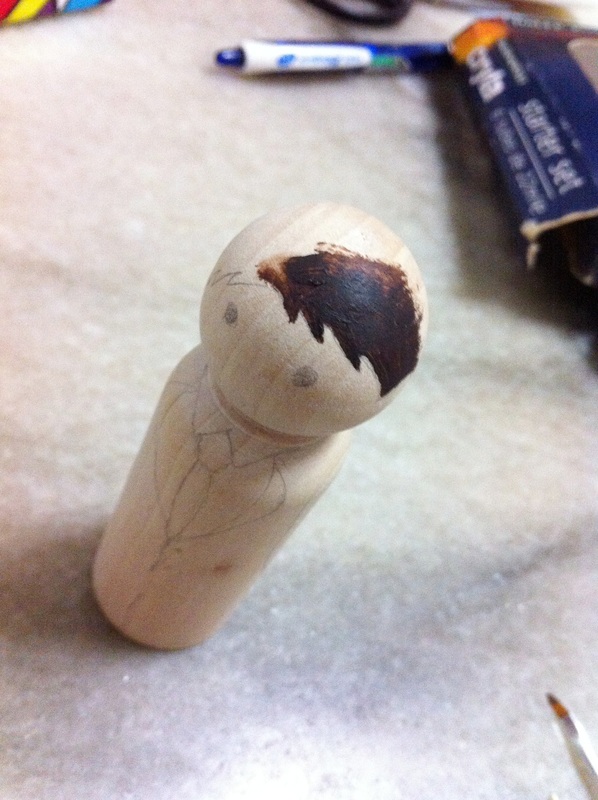 I started painting with a tiny brush and tooth pick to have an exact hair line. So far I’ve reached this stage.. will finish it soon! Glad I chose to hand paint this myself. Saved myself about $50! woohooo.